While it’s not the only inverted elephant Liberia has to offer, it is by far the rarest. Listed in Scott as number 62a, this stamp was effectively unavailable to collectors for many decades until 1973 when the sheet was purchased and broken up by the well known Canadian dealer Kasimir Bileski. All those who collect Liberian stamps will at once know what this number means. Merely to list it is enough to cause the heart to beat a little faster and the blood pressure to rise. This is the big error that has been, and is, on every Liberian want list, and it didn't matter how much money one commanded, the want lists have remained unfilled for almost the 70 years since this stamp first appeared. Colonel Rogers, in his authoritative “A Century of Liberian Philately” made note that Scott was the only catalog anywhere to list such a variety but that he had never seen it. He had plenty of company, for nowhere in the world was there a dealer who had it in stock, nor any collector who had a copy in his collection. Just one exception. There was a collector who had the entire sheet of 60 of the error, all that were ever found. It is not known when it was discovered, very likely soon after it was printed in 1905 by the great English firm of Waterlow and Sons, but for certain it was a genuine printing error found in the postal stocks. The sheet still has the number 482 which means it was the 482nd sheet to be numbered. The renowned dealer, Philip Ward Jr. acquired and sold it intact to a specialist in Liberian stamps and the sheet has remained in this collection for very many years. In a private treaty transaction through H. R. Harmer I’ve recently acquired the sheet and have broken it up. 44 copies either have been sold or are reserved for my customers, 12 are offered in this advertisement at $500.00 each. The unique corner number block is available at $3000.00. It is quite a stamp, this handsome engraved error, and very reasonable at $500.00 a copy. It is about 4 times rarer than the Canadian Seaway Invert and almost twice as rare as the U.S.A. 24c airmail inverted centre. Liberian are not exactly on the same popularity basis as these two nations but one has only to look at the present day catalog to realize that the days when Liberian stamps were only considered juvenile collector material are gone forever. It’s rather strange that there should have been any such ideas as most of the great collectors of the past had excellent specialized collections of Liberian stamps, and why not; most were the work of the world’s foremost printers, a great number by Perkins Bacon, who back in 1840 and in the following years printed the world’s first stamp and firsts for many nations. K. BILESKI LTD., STATION “B”, WINNIPEG, MANITOBA, CANADA. Bileski’s comparison of Liberia #62a with U.S.A. #C3a is particularly interesting as it shows the degree to which the value of a stamp is determined by supply and demand; while the Liberian error with even 40 copies less than its more famous counterpart is catalogued at $1250 (Scott 2012), the price of the “Inverted Jenny” has now reached half a million dollars! At least four blocks of four have existed – three corner blocks including the unique number block and one margin block which has been split up now – apparently originating from Bileski’s sheet which was pictured in Lothar von Saleski’s specialized catalog and Philip Cockrill’s Liberia series booklet no. 25. In their accounts on Scott #62a, both Cockrill and von Saleski mention a single stamp being known used, suggesting the existence of a second sheet. But, apart from these anecdotal reports no proof is given. 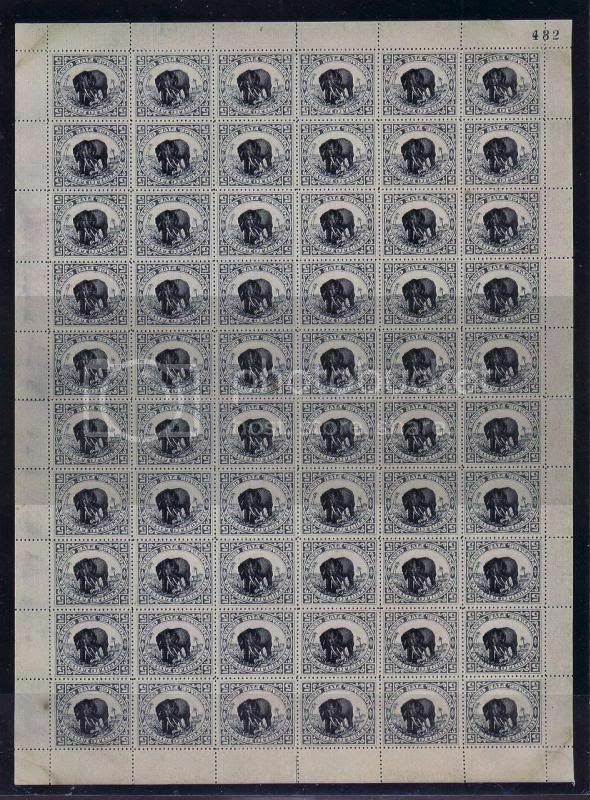 Here is a photo of the one complete sheet of Liberia 62a. Bileski broke it up to sell as singles a $500 each decades ago. He gave a photo of the sheet to each buyer. He kept the top right corner margin block of four with the sheet number 482 intact. Note that base on the sheet number location that actually it is the frames that are inverted and not the center. A small point, unknowable without the whole sheet with the number for orientation. This particular stamp has been on the top of my "must haves" for a while...hint, hint!